If you’re active in the financial markets, there are many iPhone apps out there to help you stay informed and, in some cases, even execute trades. Last year, I reviewed Bloomberg ( ), an excellent source for overall market information as well as detailed information on a particular stock or mutual fund. Here’s a look at two complementary apps that, while produced independently by separate developers, wind up working very well together. One provides stock market information, while the other lets eTrade customers view market data, see their accounts, and execute many types of trades directly on the iPhone. AOL’s recently-released DailyFinance is a free app designed to address the needs of those who follow the financial markets. DailyFinance provides real-time stock quotes, supports multiple portfolios, offers some incredible charting tools, and lets you customize market-related news feeds from numerous different sources. The amount of information available in DailyFinance is simply staggering. However, what makes DailyFinance amazing is the organized way in which that information is presented, and the interface for navigating through the sea of data. The main DailyFinance screen is a market summary, showing summaries for various US and global securities markets (DJIA, NASDAQ, Nikkei 225, and so on), as well as key currencies (Yen and Euro) and commodities (oil and gold). From the main Markets screen, tap any index summary line, and you’ll be taken to a screen showing much more detail on that particular index. Tap the DJIA entry, for instance, and you can see the current value, volume, and change in both raw units and percentage. In addition, the daily high and low, previous close and today’s open, and 52-week high and lows are displayed. Tap the News tab to see news stories specifically related to the chosen index, and tap the Charts tab to enter DailyFinance’s charting section (more on charts in a bit). Arrow buttons at the top of the screen let you move up or down through the entries on the main screen. While I found the core features of DailyFinance useful enough—I especially liked the Movers page—it’s the program’s graphing abilities that really shine. Tap the Charts tab while viewing any security or index, and you’ll see a nice graph showing prices over time, with tabs that let you quickly switch between six time periods, ranging from today to five years. At the bottom of each graph, a volume line appears in red or green, showing not only the trading volume for the specified period, but whether the security (or index) closed up or down for that period. 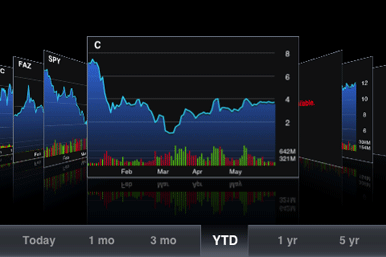 Top of the Charts: DailyFinance's charting features are intuitive and feature-rich. The real power of the graphs, though, becomes evident when you rotate your iPhone. If you’re coming from a view that contains multiple securities—such as the Movers or Portfolio screens—you’ll see a Cover Flow-like series of charts, one for each stock on the page. Flick your finger left or right to move between stocks, and each new graph rotates to the foreground with a pleasing animation. At the bottom of the screen, the same six time frame buttons appear as in the portrait view. Tap the Compare button, and a sidebar appears that lets you compare the chosen security to market indexes or its peers; see a seasonal view of pricing over the same twelve-month periods; display markers for earnings, dividend, and split events; and chart the stock against any other single security or index. I found the program to be fast and responsive to use, and its interface is well thought out and easy to use. The breadth of information available here is staggering, and I think DailyFinance will meet the needs of all but the most hard-core traders. So now that you have all this information, what if you want to do something with it? If you’re an eTrade customer, you can use the eTrade Mobile Pro app to work with your accounts—see balances, move funds, and execute trades. While the program includes some general market tools, most of its more-advanced features are only available to eTrade customers. The program launches into your Dashboard, which is a customizable home page of sorts. The Dashboard screen can display a market overview, a watch list showing securities you’re interested in, general market news headlines, news from briefing.com, and specific company news and quote information for up to two specific companies. You control which of these sections you’d like to see, as well as the order in which they appear. Non-eTrade customers also have access to quotes, a markets overview screen, and a News section. However, DailyFinance handles these tasks better than does eTrade Mobile Pro—so if you’re only looking for market information, eTrade Mobile Pro isn’t the right solution. If you’re an eTrade customer, however, eTrade Mobile Pro provides a great interface to your accounts—much preferable to loading account pages in Mobile Safari. eTrade Mobile Pro will not save your account password, and it only saves your account number if you set that option in its preferences. So if I lose my phone, I don’t need to worry about someone gaining access to my account, as they’d need to guess both my account number and my password. Yes, this makes it a bit more difficult to login each time, but for me, the hassle is worth it. Once logged in, you’ve got easy access to your portfolios, watch lists, transaction and order history, and a money transfer screen (which can be used to transfer funds from external institutions). You can also—once you login on the eTrade web site and enable agree to some terms and conditions—get streaming real time quotes. Get Real: eTrade Mobile Pro's real time quotes stream in continuously; the small bars at the top show the change with each quote. Unlike DailyFinance, the real time quotes in eTrade Mobile Pro stream in continually; when you’re looking at a stock quote, you’ll see a series of red and green bars near the top of the quote screen. Each of these represents the trend in the latest real-time quote (red down, green up). You’ll also see the security’s price changing in real time. It’s pretty amazing to see this technology in a free application for the iPhone; just a few years ago, real time streaming quotes were the province of high-end desktop apps targeted at professional traders. While viewing quotes, you can rotate the iPhone to see additional information—in portrait mode, you only see three columns, but in landscape mode, there are a total of seven information fields visible for each security. As an order placing tool, eTrade Mobile Pro works reasonably well, at least for my simpler stock-centric needs. You can’t presently use eTrade Mobile Pro to buy and sell mutual funds; just stocks and options. Some comments on the App Store page indicate that the program isn’t ideal for option trading, but that’s not an area I’m active in, so I can’t confirm one way or the other. For stock orders, after entering the ticker symbol and desired shares, you can specify an order type (buy, sell, sell short) and price type (market, limit, stop limit, and so forth), as well as the expiration (good all day, 60 days, fill or kill). I tried a simple order—one I was planning on making from my Mac—and it worked as expected. Etrade Mobile Pro’s interface is nice looking, though the main menu drops down only when tapped, which makes navigation somewhat harder than it need be. The program is relatively stable, though I have had it crash a few times during the month or so I’ve been using it. Between DailyFinance and eTrade Mobile Pro, I’ve managed to convert my iPhone into a market tracking and portfolio management tool that’s more than sufficient for my needs—which, granted, aren’t the most complex in the world. DailyFinance is an excellent source of market information, and (if you’re an eTrade client), eTrade Mobile Pro makes it simple to access and manage your portfolio directly from your iPhone. DailyFinance is compatible with any iPhone or iPod touch running the iPhone 2.x software update. 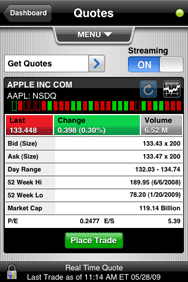 eTrade Mobile Pro is compatible with any iPhone or iPod touch running the iPhone 2.2 software update.